With China reporting blowout economic data, many expected the S&P500, just shy of its September highs, to rise above its all time record some time today. It did not, and traders can blame the creeping threat of socialism for today’s market action. 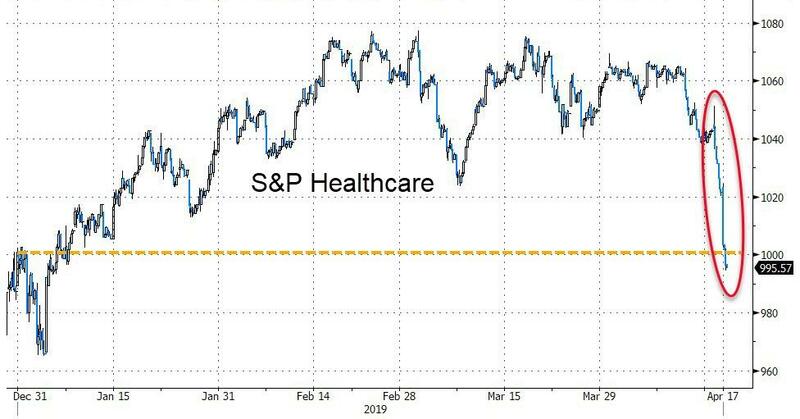 The S&P is down and flirting with 2,900 as a result of a collapse in healthcare stocks, which were roiled amid growing fears of what “Medicare for all” would mean for sector profits. The slide, as Bloomberg notes, started on Tuesday when insurance giant and sector bellwether UnitedHealth Group waded into the debate over “Medicare for All,” which would expand government-administered coverage to most of the population and rewrite the businesses of U.S. health insurers, hospitals and doctors. And while this socialist policy is still a longshot to become law – despite the backing of some prominent contenders for the Democratic presidential nomination such as Bernie Sanders – the proposal threatens to upend company stock prices. And as investor fears solidified, hospital and insurer stocks lost a combined $28 billion in market value on Tuesday, losses which capped the worst five-day stretch since 2011 for health insurers, despite UnitedHealth reporting earnings that beat analysts’ estimates and raising its 2019 forecast. The selloff continued on Wednesday as healthcare providers from UnitedHealth to Anthem and Humana tumbled, wiping out billions of dollars more in market value from some of the biggest health companies in the US, even as the Nasdaq 100 touched an all-time high after Qualcomm’s surge topped 40% following its Apple litigation settlement. UnitedHealth fell another 3%, its competitor Anthem was down 4.8% and Cigna slid 3.1%. At the same time, hospital chain HCA Healthcare dropped 2.5% and Community Health Systems lost 7%. The sharp slump has wiped out all YTD gains for the S&P Healthcare sector. It is safe to say he won’t be voting for Bernie. Putting his words in context, according to Bloomberg, UnitedHealth – as a source of coverage – is almost as large as Medicare itself, providing health-insurance services to 49.7 million people, and last year recorded revenue of $226.2 billion. In addition to insurance, it operates physician practices, sells consulting and data services, and administers drug benefits. It also covers millions of people in private-sector versions of Medicare and Medicaid. While UnitedHealth had kept a low profile, there are signs it was already becoming a target before Wichmann’s remarks Tuesday. The avalanche started when Senator Bernie Sanders of Vermont discussed his support of Medicare for All at Fox News town hall in Bethlehem, Pennsylvania, on Monday night. Fox anchor Bret Baier asked the audience at the event to raise their hands if they had private health insurance from an employer. The socialist explicitly referenced Steve Nelson, the CEO of UnitedHealthcare, the company’s insurance division, citing a Washington Post story about remarks Nelson made at a company meeting. 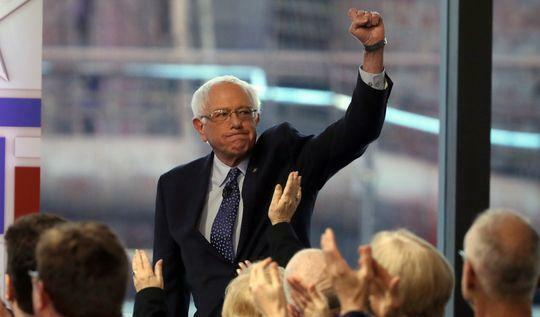 And with the Democratic primary only now ramping up – and with Bernie Sanders leading Joe Biden in the first major poll of Democratic primary contenders – expect many more such localized blow ups in various stock sectors as investors get more rude reminder that under socialism shareholders of private companies tend to be frowned upon. 21 mins ago Cornelius Rupert T.